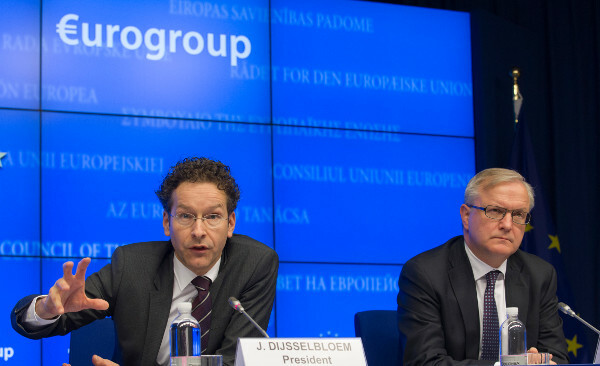 Is there no limit to the power of the Eurogroup? Greek hospitals are running out of basic items. The lifts at the ministry for finance in Athens have been out of order for months. Greek PM Alexis Tsipras is being flown around by the military; the ministerial plane has been grounded as spare parts are unavailable. Powerful men could help. They are the Eurogroup, a committee of nineteen finance ministers from around Europe whose utterances have a legal basis – the 2006 Treaty of Lisbon says the Eurogroup is an official body of the European Union. It wasn’t always like this, but a roundtable whose power and influence was steadily growing had to be brought into the open and made to look democratic. The truth is that Eurogroup’s decisional power is inversely proportional to its representative legitimacy. It takes a massive stretch of the imagination to think that the nineteen Eurozone members’ finance ministers have a continental democratic mandate, beyond their respective national borders. The length between the cast vote and their European-level leading role is too big. Legitimacy can’t travel all that distance. Having acknowledged that this important posse is here to stay, questions arise. For instance, how powerful are they? Well, they rule. Current EU Commission President Jean-Claude Juncker led Eurogroup for several years. When the establishment turned a blind eye to the heavy fiscal dumping practices in Juncker’s native Grand Duchy of Luxembourg, it was likely thanks to Eurogroup waving them aside. The group is now chaired by the Netherlands’ finance minister Jeroen Dijsselbloem of the Dutch Labour party. In reality its direction is very much steered by German finance minister Wolfgang Schäuble. Schäuble is a Dr Strangelove of sorts: as talented and single-minded as the German recruit in Kubrick’s classic, yet with one crucial difference: he does not make you laugh. The domineering Schäuble brings to the Eurogroup’s table the mood of his country’s right-wing field: one that has no inclination of conceding any ground to the Greeks’ suggestions about debt restructuring. Every owed cent has to be coughed up by the Greeks as and when they are told. ‘The Greeks have got on our nerves for too long’, said Thomas Strobl, deputy leader of Angela Merkel’s Christian Democratic Union of Germany and Schäuble’s son-in-law. Strobl’s message, delivered on national TV, went viral, and the ripple effects will reach Europe. Former Greek finance minister Yanis Varoufakis claimed last week in the Guardian that ‘for some Eurozone leaders Grexit is the goal’. He said that Dijsselbloem had told him Greece must accept the Troika ‘bailout’s logic and drop any demands for debt restructuring … the unsaid repercussion being that Greece’s banks would be boarded up’. That would mean no cash for basic provisions. The Eurogroup does not allow non-Eurozone members, even as observers, showing its obsession with control. I suspect that the fewer the potential dissenting voices, the better. But Greece is a cultural pillar of Europe which has a special place in the minds of many. And the EU is made up of 28 countries, not just 19. It is time to question Eurogroup’s mighty influence. Surely the EU can raise its democratic bar a bit higher; let’s all help lift it instead of merely indulging in vain, navel-gazing Euroscepticism. It might say Democracy on the tin of any Country or Superstate, but once the lid is prized open there lurks powerful wealthy and landed interests using “Democracy” as nothing more than a buzzword and a sop to the populace, while they do what they like. To them it`s nothing more than a vote every four or five years to allow the electorate to change things a little, but not too much. Light Vanilla or cream Vanilla. Real Democracy is vested in the hands of the people. We get to decide on the banking system, the economy, welfare etc. The real question is: Do we want true democracy? Or are we happy just to sit back and let the powerful interests shape the world for their benefit. Like an idle Dog sitting on a thistle: Yelping in pain, but too lazy to get up. Well, we can utilise the vote we get every five years to elect a Government dedicated to giving it`s citizens a say in how the country is run. Real power. It would be an uphill struggle against the established order and sacrifices would have to be made but if there is enough momentum, then yes, it can be done. It’s rather sweet that you have finally, belatedly realised that the EU is an unaccountable, antidemocratic organisation that cares only about its own survival, not the prosperity of individual member states. But you are crazy if you think that any reform is possible. average of 45% supply by industrial bakers and in the UK 90%+. bread world as “tanning parlours” for dough. offering a broader choice to consumers,” according to the OECD. to feed the Greeks pap instead of real bread. The interests of the EU Finance Ministers are clearly aligned to the interests of big business.